With over 30 years of EDI experience and our full suite of innovative EDI software products and services, 1 EDI Source has the EDI solution that is best for your business. 1 EDI Source offers several ways to implement and integrate EDI in your organization to help lower costs and enhance revenues. Compare our products below, or use our EDI Software Product Finder to determine which one is right for you. HQX bundles our EDI HQ mapping and translation software, IX visibility portal and AS2 Complete data encryption software with expert in-house technical support for an enterprise EDI platform with unrivaled depth and flexibility. Rely on the 1 EDI Source experts to manage your EDI exchange and ensure trading partner compliance, allowing you to focus on your core business. MX also provides you with a visibility portal to view valuable business documents. HQ gives you full control of EDI operations, transaction visibility and data access. Simplify business processes, satisfy trading partner requirements, manage by exception with alerting, and integrate with back office systems. 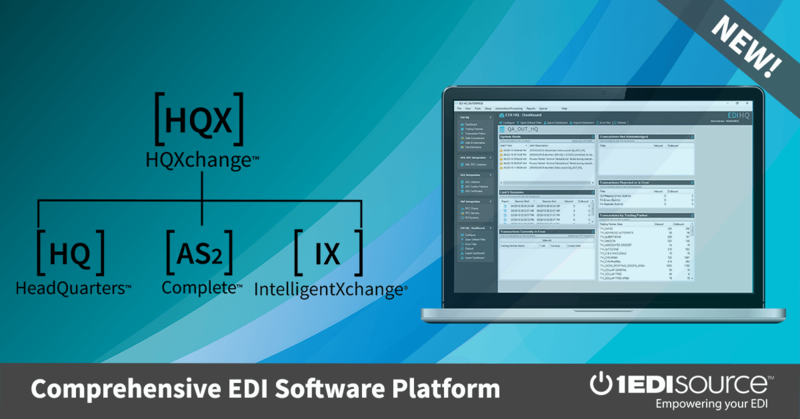 PX is an intuitive EDI solution designed for users with minimal EDI experience. If you are new to EDI or need to streamline operations with a few trading partners, PX is an easy, intuitive solution to get you up and running fast. IX is an easy-to-implement visibility tool that works with any EDI translator and can be accessed across your company’s departments. Full EDI insight to identify and fix issues before they affect revenue or business relationships. AS2 communications made effortless. Establish a secure connection quickly and simply, and begin sending and receiving data with your AS2 partners immediately.